Ensure that the shift lever is in p and depress the brake pedal. Touch the toyota emblem side of the electronic key to the engine switch. 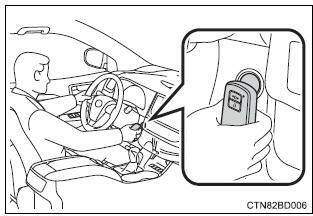 When the electronic key is detected, a buzzer sounds and the engine switch will turn to ignition on mode. When the smart key system is deactivated in customization setting, the engine switch will turn to accessory mode. Firmly depress the brake pedal. shown on the multi-information display. In the event that the engine still cannot be started, contact your toyota dealer. Shift the shift lever to p and press the engine switch as you normally do when stopping the engine. As the above procedure is a temporary measure, it is recommended that the electronic key battery be replaced immediately when the battery is depleted. Release the brake pedal and press the engine switch in step 3 above. The engine does not start and modes will be changed each time the switch is pressed. Make sure that the smart key system has not been deactivated in the customization setting. If it is off, turn the function on. Check if battery-saving mode is set. If it is set, cancel the function.